The northwestern peninsula of Cyprus, known as Akamas, is a wild uninhabited region with spectacular landscapes and beaches, due to be designated a National Park. The area is named after Akamantas, an Athenian warrior, and son of Theseus, who arrived here after the Trojan War. It is a unique area of biodiversity, habitats, and ecosystems. Almost all the geological formations of Cyprus are met here, from narrow deep valleys to caves islets and gorges. There are over 500 different types of plants and nature trails that Chriss cross the peninsula passing through unspoiled areas of extreme physical beauty. The area is ideal for hiking, cycling, diving, and swimming in crystal clear waters. 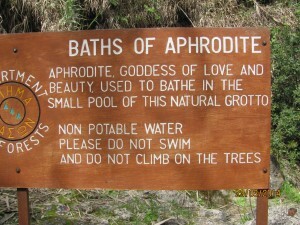 The “Baths of Aphrodite” is an area in the Akamas between Polis and Cape Arnaouti. It derived its name from a small grotto shaded by an old fig tree, in the waters of which, legend has it, the goddess Aphrodite used to bathe. According to mythology, this is where she met her lover Adonis. The site is on the Aphrodite Cultural Route. The Goddess of Love used to take her bath in a cool pond near Polis. The place is known as “Baths of Aphrodite” and provides a magnificent view of the Bay of Polis. 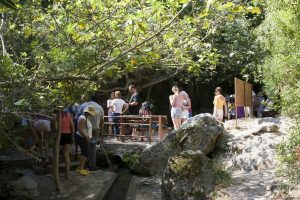 According to legend, after swimming in the crystal clear waters of the Bay, Aphrodite used to bathe in this pond, surrounded by an idyllic landscape with the sweet smelling wild flowers. It is here that she met her beloved Adonis for the first time. 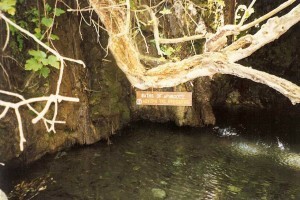 Adonis was hunting in the Akamas forest when stopped over the wonderful spring to quench his thirst. He was struck by the sight of the naked goddess bathing in the crystal waters. Aphrodite and Adonis were instantly bewitched by each other’s extraordinary beauty. The myth lived on through Middle Ages. Another legendary spot is “Pyrgos (castle) is Rigainas” which is linked to the love of Rigaina and Digenis, (the Medieval queen of Cyprus and the Byzantine hero), as well as with Aphrodite. the “castle” which is actually a monastery, now ruins, is in the center of Akamas in a majestic clearing, with a giant oak tree and the bubbling spring. According to the legend, the goddess of Love used the place as a refuge after her bath.